OUR DEEPEST SYMPATHIES We would like to begin by giving you our condolences — our hearts go out to you for your loss. The death of a loved one is one of the most difficult situations you can find yourself in. In addition, there are necessary things that must take place before the deceased can be laid to rest and the healing process can begin. Funerals often require extensive planning and decision-making, and even as you are still dealing with the feelings of your grief and distress there are innumerable arrangements to make for the deceased. During such times, it is easy to feel overwhelmed by all of the little details — the logistics of transportation for you and your family on the day of the funeral does not need to be on your list of worries. Eliminate the potential stress of looking for directions, navigating traffic, or being late; it’s the last thing you need. We take it upon ourselves to diligently plan out the details so that you won’t have to because we know that your focus should be on remembering the life of the deceased, and consoling and sharing your loss with those left behind. GIVING YOU PEACE OF MIND The day of the funeral can be extremely emotional, and you and your family may not be up for driving. You may have attendees from out of town who are not familiar with the Wilmington area and require a rental vehicle for the day. Or you may simply be looking for a more formal and dignified way to send off your loved one and say farewell. Whatever the circumstances, our limo rental service can help ensure that the day runs smoothly by providing you with safe and timely transportation. It is both a practical and sophisticated option for you to reduce the amount of planning involved in these situations. 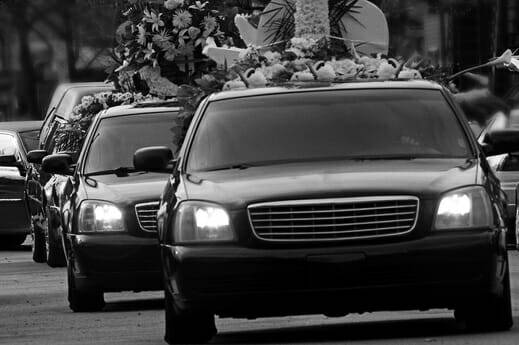 Typical funeral limousine service provides transportation between the funeral home and the site where you have arranged for a casket to be buried; however, we will help you figure out the logistics for the day specific to your needs. You can arrange for pickup and drop off at your home, the funeral home, the church, or burial site. Our vast fleet of vehicles includes black stretch limousines and town cars appropriate for a somber occasion. Taking into consideration the number of people, we can work with you to determine which of our vehicles will best suit your requirements. By sharing a ride in one of our clean and well-kept vehicles fully equipped with modern comforts, you and your family can stay close together as you move from one location to the next, lending each other comfort and support throughout the day. Multiple funeral limousines in Wilmington can be coordinated to accommodate larger families or other guests so you can feel confident that everyone will arrive when and where they need to be. Let the occasion be about memorializing the deceased. WE ARE HERE TO HELP Not all funeral homes provide their own limousine service, or have enough vehicles to accommodate the needs of a larger funeral party. Contact us in advance to inquire about our affordable packages and how we can provide assistance to you during this particularly difficult time. We can accommodate and customize our limo services to fit your needs for the day of the funeral, and as industry professionals with extensive experience in funeral services in the Wilmington, Delaware area, we will work with you and the funeral home director to make sure you are provided with the utmost care. You can trust us with the seating arrangements, procession order, and other finer points of funeral etiquette. We will provide you with a highly qualified, professional and courteous chauffeur who will not only be there as a driver but will also gladly assist you as you go about your day, keeping you informed and explaining what will happen. Your chauffeur will give you the time and space you need to collect and ready yourself each step of the way. You can be assured that you will receive the utmost respect and privacy. Our goal is to ease your mind and make what can be an intimidating and confusing process be as simple and hassle-free as possible so that your attention can be given to the truly important aspects of the funeral day.